CONTRIBUTORS to menu and social networking food web sites are making pretty big claims that East West Gourmet, nestled on the second floor food court in Chatswood’s Manadrin Centre, has one of the best Hainanese chicken rice in Sydney. The Mandarin Centre is a retail centre in Chatswood (on Sydney’s North Shore), and its food floor, with some 20 food outlets mainly featuring food from around Asia, is popular with shoppers and Chatswood office workers. East West Gourmet seems to have a following – if the lunchtime queue is anything to go by. It has illuminated photos (like most Asian food court stalls), featuring some 42 individual dishes on its wall which glare brightly at passers-by and to hook regular folk in there is a bain marie serving a variety of simple Asian classics (three serves for $7.50 or two for $5.50). There are at least four people busily working in the tiny kitchen. By hanging around the serving area after I ordered it seemed that there were a lot of orders for Hainanese chicken rice ($9), chicken & beef fried rice noodle ($9.50), chicken laksa ($9.50), the intriguing and delicious looking salmon fish head noodle soup ($9.50), brisket of beef in bean chilli soup ($9.50), and mee york Penang style har mee ($9.50) which is only available from Thursday to Saturday (possibly because the time needed to make the prawn stock). 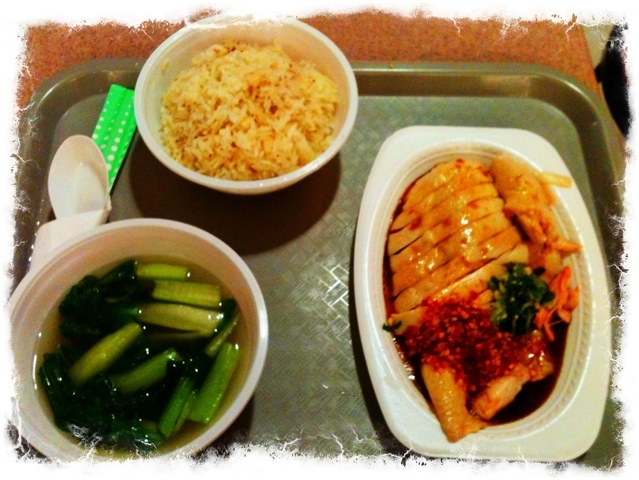 On my first visit I just had to have what everyone was raving about – the Hainanese chicken rice (no.8 on the menu). Out it came – one plate with a decent-sized chicken Maryland cut. This generous serve of steamed chicken was swimming in a light and sweet soy sauce and topped with a chopped shallot, garlic and ginger oil as well as a crushed chilli and garlic sauce with hints of vinegar. Accompanying it was a bowl of steamed, fluffy and fragrant long-grain rice infused with fresh ginger. There was also a basic clear soup with some chopped greens. I have to admit – it was pretty damn good and got me back to East West Gourmet the following two lunch times just to have the chicken rice and to make sure that it was consistently ‘that good’. It was. Impressed by its chicken rice I wanted to see what else East West Gourmet could produce and was lured back there on another couple of afternoons. The beef brisket in bean chilli soup (no. 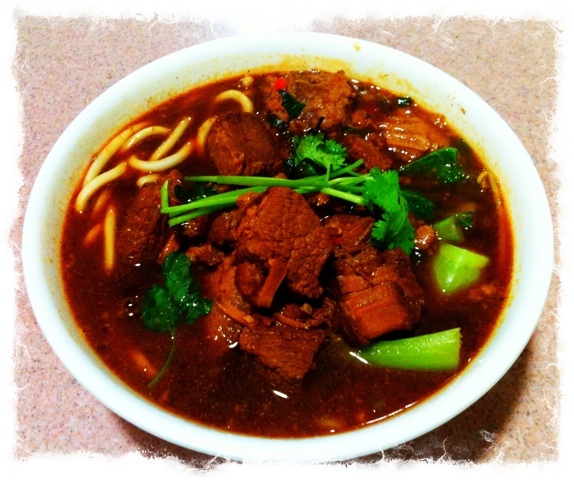 1 on the menu), is a rich and dark meaty broth with 3cm cubes chunks of beef, thick round white noodles and bok choy. It was very much like a classic Taiwanese beef noodle soup (niu rou mian). The steaming broth was enhanced by a chilli and black bean paste with the addition of finely-chopped garlic. It had a sweet five-spice perfume to it. The stewed beef was tender and tasty with hints of star anise and five spice. Bean shoots and coriander was a welcomed addition and the beautiful and tender wheat noodles were chewy and started to develop the characteristics of the soup by slowly soaking up that beautiful rich soup (so much so that they started to get a reddish-brown stain). There would have been some eight to 10 pieces of beef. A hearty meal for lunch. I am definitely returning to have it on a cold winter’s day. 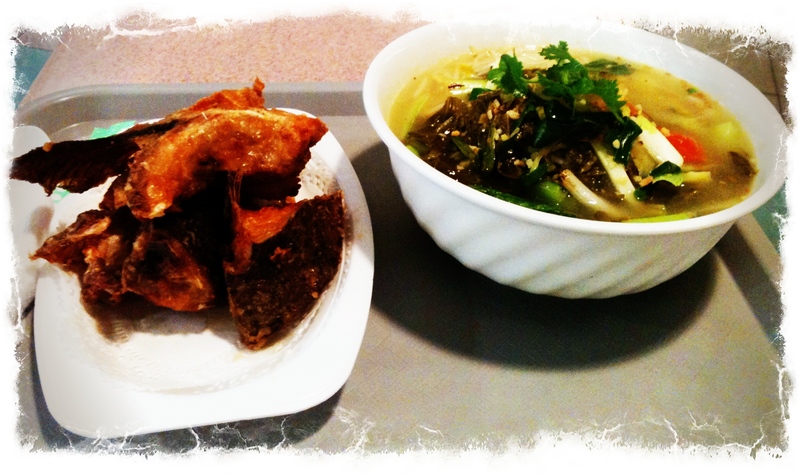 On my last visit I just had to order the intriguing salmon fish head noodle soup. Out came a large bowl of soup and next to that the cut up and fried salmon head. The soup was a clear vegetable-based broth of minced garlic, pickled cabbage, tomato, greens, rice noodles, long pieces of spring onion, sliced ginger and bean sprouts. It was slightly sweet and sour (like a ripened tomato) but well-balanced – the much-needed acidity helping to tackle the fried salmon head. The salmon was chopped into huge pieces and simply seasoned with salt and pepper and then deep-fried. I added a dollop of sambal to the side (available on the counter along with other condiments). This is “pick it up with your fingers, smother it in sambal and rip it apart or dunk it into soup’ kind of dining. The soup revitalises the palate from all that lip-smacking and tasty crispy skin and pink and white oily flesh. Who needs fish oil capsules when you can get an Omega-3 rush in a single meal like this. Brain food at its best. It ain’t everyone’s cup of soup but worth trying and again another big meal but this one conquered me and a bit of soup was left in the bowl. The quality of East West Gourmet’s dishes are impressive. As the Singaporeans may say – East West Gourmet is shiok! 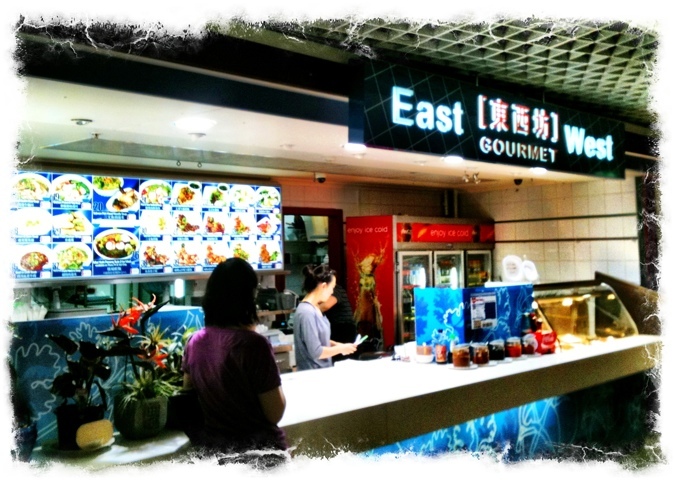 What: East West Gourmet, stall No. 204, Level 2, Mandarin Centre, 61-65 Albert Avenue, Chatswood, NSW Australia. The verdict: Don’t waste time and money flying to Singapore for the food – it’s all here. This little Sydney food court kitchen produces some of the best and consistent Hawker classics outside of Asia. Ate there: 4, 5, 7, 12 and 14 April 2011. This entry was posted in Chinese, Hawker food, New South Wales, Street Food, Sydney, Taiwanese and tagged Australia, Chinese, Food, food court, hawker, Noodles, street food, Sydney. Bookmark the permalink. The Hainanese chicken rice looks SUPER tasty. Wish I had more of this kind of stuff where I live….or I could learn to cook it. Thanks HBV, another great review, but can’t you hold off on sending these till lunchtime! Now I feel like eating Hainanese chicken rice and it’s 8:30am! Thanks for taking me here for a lunch date. I didn’t appreciate you putting the moves on me, but at least the food was delicious! You’re a comedian and will be suitably embarrassed in a future blog. Thanks- I’m here all week. Try the fish head soup! Man, I LOVE the special fried rice, and char kuey teow :D. You gotta try those mate! We’re glad that you liked the food. Would love to see you back one of these days and try out some more food in the food court and the restaurants as well. Shared your post in our pinterest, facebook and twitter accounts, if that’s ok with you.